Some of the main reasons why people visit Bangkok, Thailand are the amazing and popular architectural landmarks. There are the majestic golden temples and palaces, amazing museums, and the great teakwood mansions. One can also do nonstop shopping, indulge in luscious gastronomic experience, and so much more. It’s easy to get lost in this wonderful Asian city. It is then important that you have a small guidebook that will help you figure things out as you roam around. Another thing to keep in mind is about money matter. You should remember to break down your money into smaller bills. Carry only 20 or 100 Thai Baht and hide your B1000 bills somewhere safe. Right now, $1 is close to B32 to B33. This is what Bangkok money looks like. It would be best if you keep more of the smaller value bills than the 1000’s. Lastly, you have to understand that English isn’t the first language of the native people, so speak clearly so you can be understood. They pronounce the English language differently, so you also have to be a good listener. Five days may not be enough for you to adjust to the lifestyle in Bangkok, especially with the strong humidity and heavy traffic. Bangkok is a big and busy city, which is relatively disorganized. However, if you explore the city more, you will find different attractions that range from beautiful palaces to lively nightlife. Some tourists are not big fans with how downtown Bangkok can get a bit chaotic, but other tourists love the energy and lively colors of the city. The luxurious high-rise buildings, the golden Buddhas, the smell of the delicious foods, and the crowd are absolute people pleaser. Here is a list of the ten best things you can do in the city. You can do two of these activities every day to experience them all in just five days. Experience a boat ride in the Chao Phraya River. Every tourist who comes to Bangkok should not miss a riverboat ride on the Chao Phraya River. When you do this, you will be able to experience Bangkok and have a tour around the city without encountering the uncomfortable busy traffic. There are docks along the riverbank that can offer you a boat ride. This is a very cheap and quick means of transportation from one place to another. Climb Wat Arun. Wat Arun is located on the other side of Chao Phraya River. You can get there by taking a taxi or via cross-river ferry. There are two docks on the side of the River where Wat Arun is. You can head straight to Wat Arun after your boat ride on the Chao Phraya River. Standing at 79 meters high, the temple with broken pieces of porcelain gives you a spectacular view of the city. Wat Arun’s name is based on the Indian god of dawn, Aruna. Stroll Dusit Park. Many tourists neglect to stroll at Dusit Park, which is one of the most beautiful places in the city. If you have experienced too much pollution, swarm of crowds, and the hustle and bustle of Bangkok, you should go to Dusit Park to relax. It is the place of nature’s tranquility. Dusit Park is an effort of King Chulalongkorn to westernize the city by creating a garden-like park complete with teak mansions. In this park, you should visit the Vimanmek mansion, the summer palace of the royal family back then, and the Abhisek Dusit Throne Hall. Have a drink at Vertigo Bar. 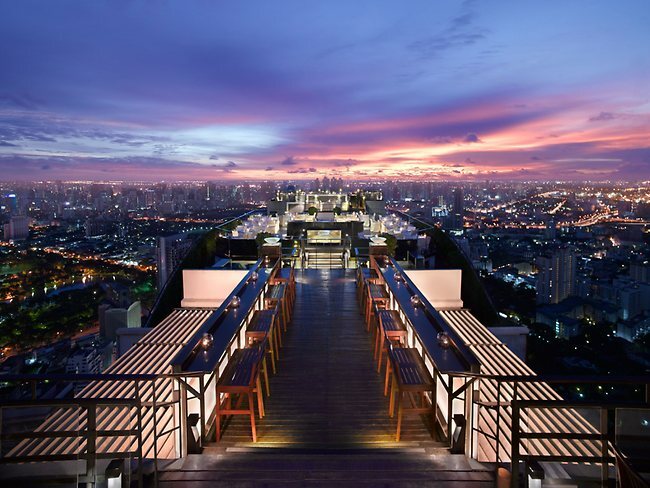 At night, you can visit the Vertigo Grill and Moon Bar located on top of the Banyan Tree hotel. This wonderful bar has one of the best night views in the city. You can sip cocktail at the top of the 61st floor, which is 196 meters high. If the weather is great, you can definitely have fun in their open-air bar. Take pictures at the Grand Palace. If you brought your camera, you should go to the Grand Palace and the Phra Kaeo. These are the tourists’ most photographed landmarks. King Rama I built this palace back in 1782 as a home and as a place where he can put the Emerald Buddha. The royal family now resides in the Dusit area. Wat Phra Kaeo is the holiest place in Thailand. Experience a wonderful massage at the Reclining Buddha, Wat Pho. As a tourist, you must visit the oldest and biggest temple in Bangkok, the Wat Pho. This temple was built back in the 16th century as a place of education and traditional medicine. It is now a prestigious massage school where tourist can experience the original Thai massage. You should also go to the Chapel of the Reclining Buddha where a 46-meter sculpture of Buddha fills the chapel. Eat at Chinatown. Food is an important part of any country’s culture. To have a taste of some of the best foods that Bangkok has to offer, you can eat at the colorful, busy, and noisy Chinatown. Chinatown is riddled with Chinese shrines, market stalls, medicine stores, gold shops, snack stalls and spice shops. Eat some good Chinese food, like dim sum, when you visit this place. The Chinese in Bangkok used to live in the Old City area but was transferred to the capital city across the river by Rama I back in 1782. Take the Tuk Tuk ride. Your Bangkok experience won’t be complete without experiencing a Tuk Tuk ride. This is another means to go around the city. Don’t forget to negotiate properly about how much you will pay before you take a ride. Make sure you are aware of the places where you want to go to because some Tuk Tuk drivers might tell you the sight is closed so they can take you to a farther place and charge you more. Be firm when you negotiate with a Tuk Tuk driver. If you do, you’ll be fine and you will definitely have fun looking at the city sights as you sit down on that rickshaw. Visit old Jim Thompson’s House. Yes, Jim Thompson the famous American silk merchant. He came to this city back in 1945 and became a social celebrity for contributing to Thailand’s silk industry. However, while walking in the Cameron Highlands in Malaysia in 1967, Thompson mysteriously disappeared. His house has become a landmark in Bangkok. It is an archetype of a traditional Thai teak house and is also one of the best museums in Thailand. Experience the beauty of his home to have an idea how it is like to become a beloved native from being a foreigner. Shop at the Floating market. Shop ‘till you drop, but this time, just don’t because dropping would mean drowning at the same time. Your shopping experience in Bangkok isn’t fully realized if you haven’t been to the floating market. Damnoen Saduak is the leading market. Take a boat trip through the maze of canals where merchants in wooden rowboats sell fruits, vegetables, spices, snack foods, flowers and straw hats. You can find the floating market at around 62 miles southwest of the city. It would be best to go there in the morning from 7am to 9am to really appreciate its beauty. Besides these top ten things you should do in Bangkok, there are plenty more tourist destinations the city has to offer. Thonburi Khlong Riverside Tour is one. This place will give you a real sense of the daily living of the grittier part of real Bangkok. Siam Square is another place you should go to in the city. If New York has the Fifth Avenue, and London has the Bond Street, Bangkok has the Siam Square. Rambuttri is a place that can give you a travel back to time to how Bangkok was when there were still no skyscrapers. It gives anyone that sense of history of the city. The electrifying nightlife of Bangkok is something you definitely should not miss. The nightlife in Bangkok is considered as one of the best in the whole world. Soi Cowboy, Nana, Pat Pong, Khao San, Sukhumvit 11, RCA and Thonglor must be on your nightlife list. ← If Gym is a Big NO, Try Yoga.